Figure 1. | Large American chestnut in North Carolina. (Forest History Society). American chestnut (Castanea dentata Marsh. Borkh) was a widely distributed and abundant tree that was highly valued for food, rot-resistant lumber, and tannin. The species could attain large sizes and had a fast growth rate (Figure 1), but was decimated by exotic pests from Asia, notably the chestnut blight (Cryphonectria parasitica Murr. Barr). 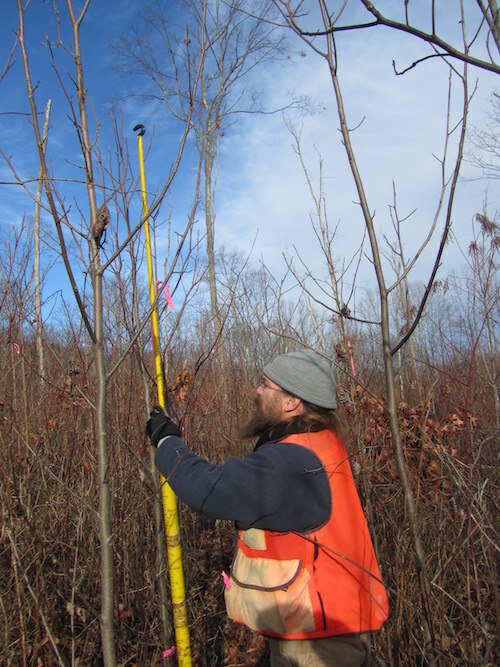 The Upland Hardwood Ecology and Management Research Work Unit (RWU-4157) has been conducting American chestnut research since 1995. The primary goal of the chestnut research program is to develop and test protocols to restore this species. We specifically examine planting prescriptions, effectiveness of hybrid tree breeding, and silvicultural practices. How can we develop high-quality nursery seedlings that will be competitive after planting? Is it best to plant chestnut seedlings in open-conditions or under shaded conditions that will be opened up in a few years? Will hybrid chestnuts bred for blight-resistance behave similarly to pure American chestnut while maintaining blight-resistance from the Asian parent? What Happened to the Chestnut? Figure 2. | Chestnut blight fruiting bodies on base of planted seedling. Figure 3. | Suspected Phytophthora cinnamomi on root of tree. American chestnut was a keystone species in the eastern hardwood forests, and its demise has altered forest ecosystems by reducing species diversity, reducing availability of hard mast, and changed soil and litter dynamics. 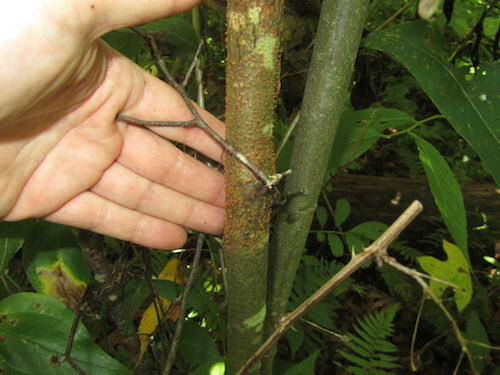 The American chestnut was decimated by an exotic fungus known as the chestnut blight (Figure 2), when the blight was introduced into North America in the early 20th century. 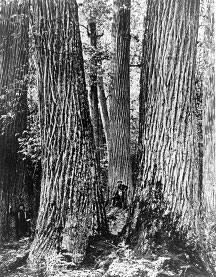 A root pathogen, Phytophthora cinnamomi, introduced in the 19th century also killed American chestnut and chinkapins in the southern portion of the species’ ranges. 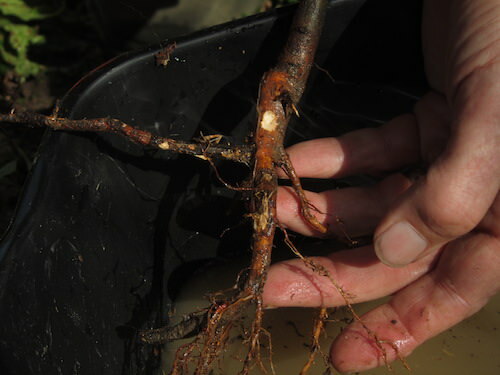 This root pathogen has been a primary barrier to species reintroduction in the south because it destroys the root system and the tree is unable to sprout (Figure 3). The loss of the American chestnut as a mature component in eastern forests has resulted in large-scale changes in species composition, particularly on upland well-drained stands where the species was most competitive. In the absence of Phytophthora cinnamomi, American chestnut has managed to exist as short-lived stump and root sprouts, which will occasionally live long enough to flower and bear fruit. The Forest Service does not conduct breeding of blight-resistant trees, but partners with breeding programs like The American Chestnut Foundation (TACF), a private non-profit organization whose goal is to produce blight-resistant chestnut trees through a back-cross breeding program involving the blight-resistant Chinese chestnut (Castanea mollissima Blume). The TACF breeding program's end product is essentially an American chestnut with blight resistance from Chinese chestnut. The first material in the TACF's program tested for blight-resistance was the third intercross of the third backcross generation (BC3F3). Seedlings from this generation are theoretically 15/16 American chestnut with 1/16 blight resistance from the Chinese chestnut. BC3F3 nuts were produced in sufficient numbers for testing for the first time in 2007. However, chestnut restoration does not end with development of a blight-resistant tree. A prescription for how and where to plant trees is needed. We are conducting research to develop prescriptions that managers can use for planting blight-resistant American chestnut seedlings. We are also working with multiple partners including The University of Tennessee's Tree Improvement Program, the Tennessee Division of Forestry, the Southern Region of the National Forest System, Clemson University, and Mississippi State University. Making History, the First Restoration Test Plantings Established on National Forests! American chestnuts were grown for one year in a commercial tree nursery as bareroot nursery seedlings, and nursery protocols designed to maximum seedling size were tested. After one year in the nursery, eleven field tests were established in 2009, 2010, and 2011 (Figure 4). Seedlings averaged 3 to 4 feet in height at the time of planting, but were highly variable in size. Trees were out-planted into shelterwood harvested areas (residual basal area of 10-20 ft2 acre-1) or underplanted in stands where the midstory had been removed with an herbicide hack-and-squirt injection. Figure 4. | An American chestnut planting site at the time of planting establishment. The Southern Research Station’s Upland Hardwood Ecology and Management Work Unit is leading the way to provide information on seedling performance of American chestnut in ‘real-world' forest conditions. 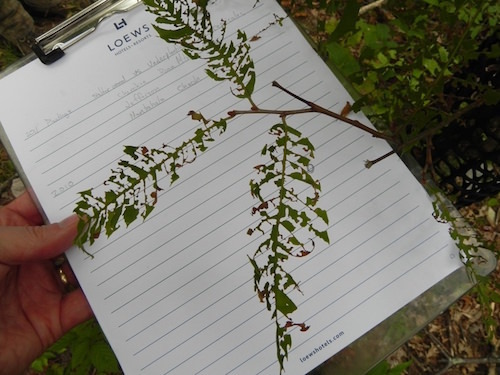 Data collected includes survival, growth, competitive ability, bud-break phenology, and disease, insect, and animal damage. Results will provide guidance to managers on national forests that will soon be receiving chestnuts for large-scale reforestation efforts. The data will also help TACF in making selections of superior families in their breeding program. 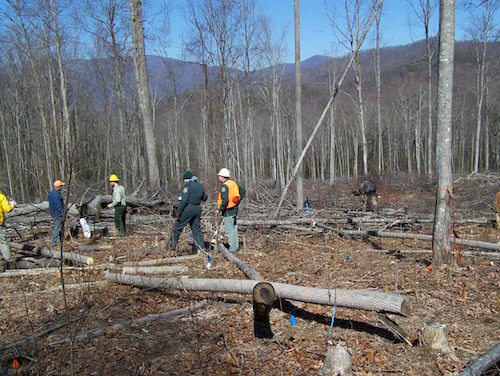 The test plantings can be used as education and demonstration sites for local citizen groups and professional organizations to illustrate how forest management can be used in the restoration of a native species. Figure 5. | A large American chestnut seedling four years after planting. Survival for the plantings was highly variable and was greatly impacted by Phytophthora cinnamomi. Where root disease was not a problem, survival averaged approximately 80 percent after 4 years, and height averaged 7 feet, but could be as high as 3 feet of growth per year (Figure 5). Results indicate chestnut is competitive with natural vegetation on site, at least in the early years when competition is most intense. We speculate that root rot disease was likely imported unintentionally from the nursery where the seedlings were grown prior to planting or was on the site prior to planting. The wet spring in 2011 contributed to the seedlings’ demise because Phytophthora cinnamomi thrives under wet conditions. Some plantings had better survival than others, and we suspect soil conditions at these sites was less conducive to root rot disease. For all plantings, seedling size at the time of planting affected size in later years. Larger seedlings maintained and increased their size advantage, indicating grading seedlings by size prior to planting will probably improve competitive ability of seedlings. It is too early to make definitive conclusions on blight resistance and field performance of hybrid seedlings, but early results indicate that the BC3F3 generation seedlings had similar blight resistance to the Chinese chestnut. However, BC3F3 generation seedlings had slightly reduced growth compared to the American chestnut. We will continue to measure plantings to determine changes to expected or desired traits over time. There were several pests and pathogens, other than blight, that impacted these plantings. Most notably was root rot due to Phytophthora cinnamomi. The solution to this problem might be to grow seedlings in containers using non-contaminated soil or it might be to grow seedlings in more northern nurseries where the disease can’t survive. These methods will be more expensive and more difficult, but will hopefully result in higher survival. In 2015, we established a preliminary test of seedlings produced using a modified version of the Root Production Method®, versus bareroot nursery seedlings from the Indiana state nursery in Vallonia. Figure 6. | Defoliation caused by the Asiatic oak weevil. Photo by Albert Mayfield, US Forest Service. Deer browse was also a major concern, with deer browsing 3 percent to 80 percent of trees at each site. Deer protection shelters were erected in problem plantings or deer repellent applied at regular intervals in other plantings. We have also had defoliation by native and non-native insects, and the extent of the damage is highly variable according to site and genetics (Figure 6). Clearly, restoration of American chestnut is going to be difficult, but the ecological and utilitarian benefits of species restoration to the eastern forest ecosystems would be extremely valuable. Clark, S.L. Schlarbaum, S.E., Saxton, A.M., and Hebard. F.V. 2015. Establishment of American chestnuts (Castanea dentata) bred for blight (Cryphonectria parasitica) resistance: influence of breeding and nursery grading. New Forests 47(2):243-270. Clark, Stacy L.; Schlarbaum, Scott E.; Saxton, Arnold M.; Hebard, Fred V. 2012. Nursery performance of American and Chinese chestnuts and backcross generations in commercial tree nurseries. Forestry 85:589–600. Clark, Stacy L.; Mcnab, Henry; Loftis, David; Zarnoch, Stanley 2012. American Chestnut Growth and Survival Five Years after Planting in Two Silvicultural Treatments in the Southern Appalachians, USA. Forests 3:1017-1033. Anagnostakis, S.; Clark, S.L. ; McNab, H. 2011. Resistance of chestnut trees to Asia chestnut gall wasp. In: 101st Annual Report of the Northern Nut Growers Association, Inc. Wooster, Ohio: July 18 - 21, 2010. 1:15-17. For more information, contact Stacy Clark at stacyclark@fs.fed.us or 865-974-0932.